Good afternoon, Agents and Investigators. My name is Mustafa Said and welcome to a special edition of Niantic History. 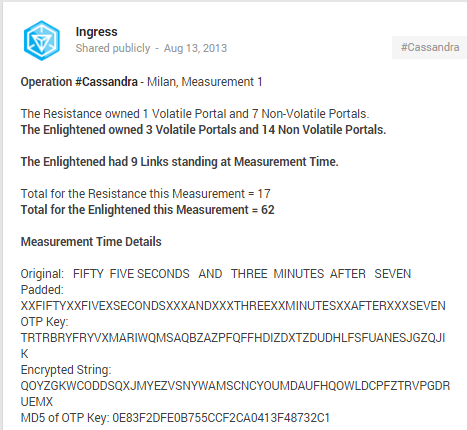 The Cassandra Anomalies. A massive Anomaly covering 13 cities around the world. The goal: control the cities. It was an all-out struggle to either free the minds of the global the economic, social and political power-centers of our society or to protect them from further Shaper Ingression. The massive battle ahead struck first in Sydney, Australia on August 11th, 2013. 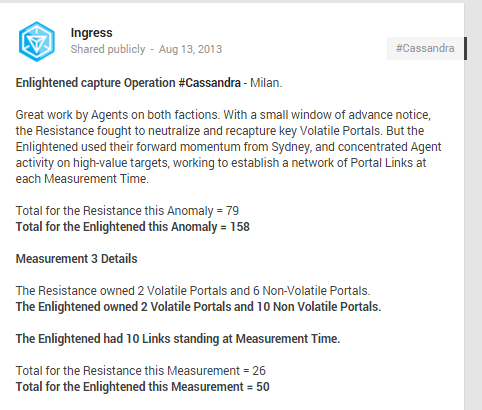 With little time to spare the world of Ingress quickly moved attention to the next battle ground in Milan, Italy on August 13th, 2013. Mustafa: First question, When you discovered that your area was getting an anomaly, how did your faction plan for it? Stefano: The plan was clear and simple: to evenly divide the resources available in the area, leaving small subcluster portals focusing on birds after. The men on the field they would take decisions in the light of developments. Mustafa: Okay, second question is: At what point did you feel like the ENL could gain the upper hand? Stefano: During the course of the game we did not have real-time updates on the score. We were focused on what we needed to do, which is take the portals. We knew the game was going well because our companions were happy with the result on their cluster. Their smile was the answer. Mustafa: Third question is: What are your overall thoughts that you took away from the anomaly? Stefano: To this question I can only answer personally. In my opinion the anomalies as they focus on teamwork, preparation and coordination even though, in the case of obvious superiority in numbers, won the faction with more men on the field. Mustafa: Finally, what do you think Cassandra was about? Stefano: I’m sorry, we don’t know. There are so few people that follow the story because it is so dense and complicated. 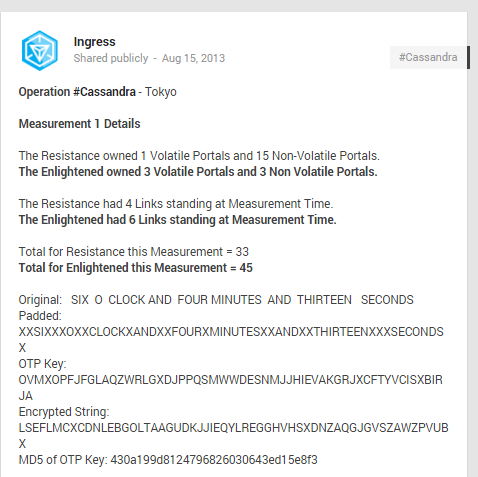 With two anomalies under their belt, no time was wasted as attention quickly turned to the final site of the first week of Cassandra, Tokyo, Japan. The date, August 15th, 2013. Taicho: When I learned that Tokyo was going to have a Cassandra Anomaly, I was very unaware of what an XM Anomaly was because all information about the anomaly was being leaked in English. We thought official events were so far from Tokyo. 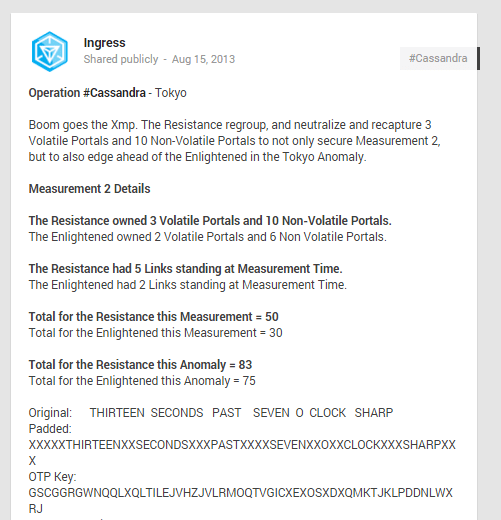 So we(ENL Tokyo community) had to learn about the anomaly. 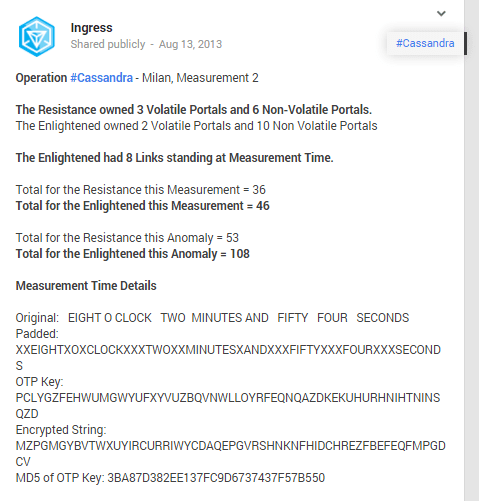 We watched [email protected], and read rules well. Mustafa: Second question, At what point did you feel like the RES could gain the upper hand? Taicho: There were about 30 ENL on site while the RES had about 60 or 70 on site so we felt very outnumbered. Mustafa: What are your overall thoughts that you took away from the anomaly? Taicho: Meeting and fighting with a lot of agents was so fun! 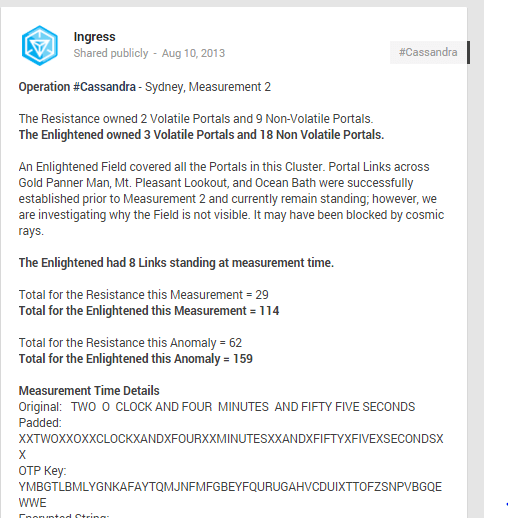 We had to work hard for [email protected] because cluster maps were leaked only a day before anomaly. However, I still think it was fun. Mustafa: What do you think Cassandra was about? Taicho: [email protected] is the first official event for us. It is history for all Japan agents, regardless of faction. 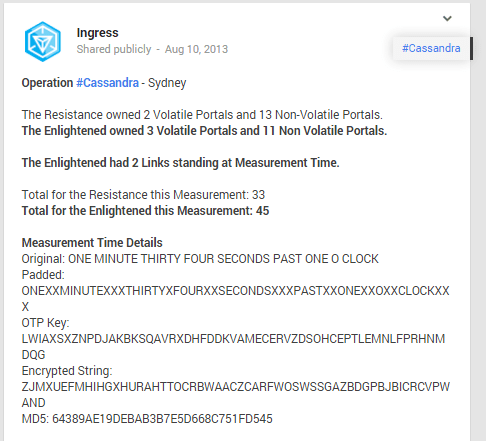 With that, the first week of Cassandra Anomalies was over. The fight, however, had hardly begun….. 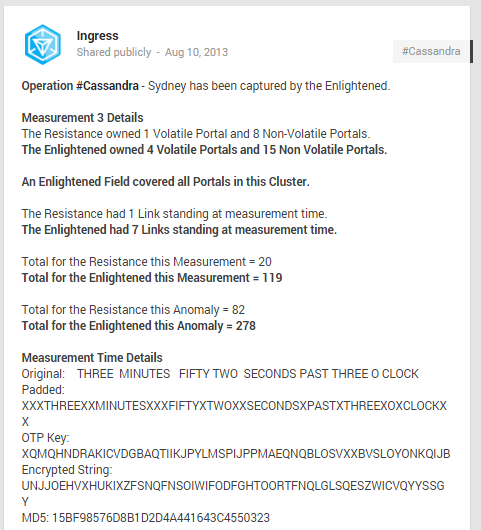 Tune into DeCode Ingress next week to see how it all ends: The Cassandra finale is coming….